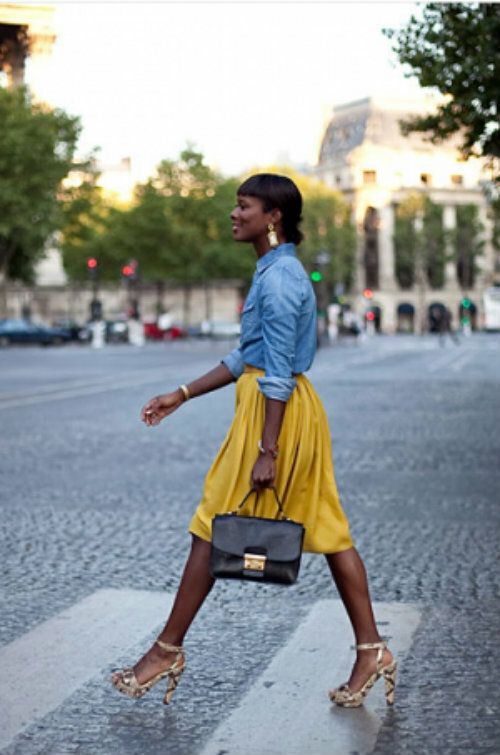 Simple Ways to rock the Chambray shirt this spring! The fight between Chambray and Denim has always been confusing for fashion lovers. They both seem similar but are very much different. 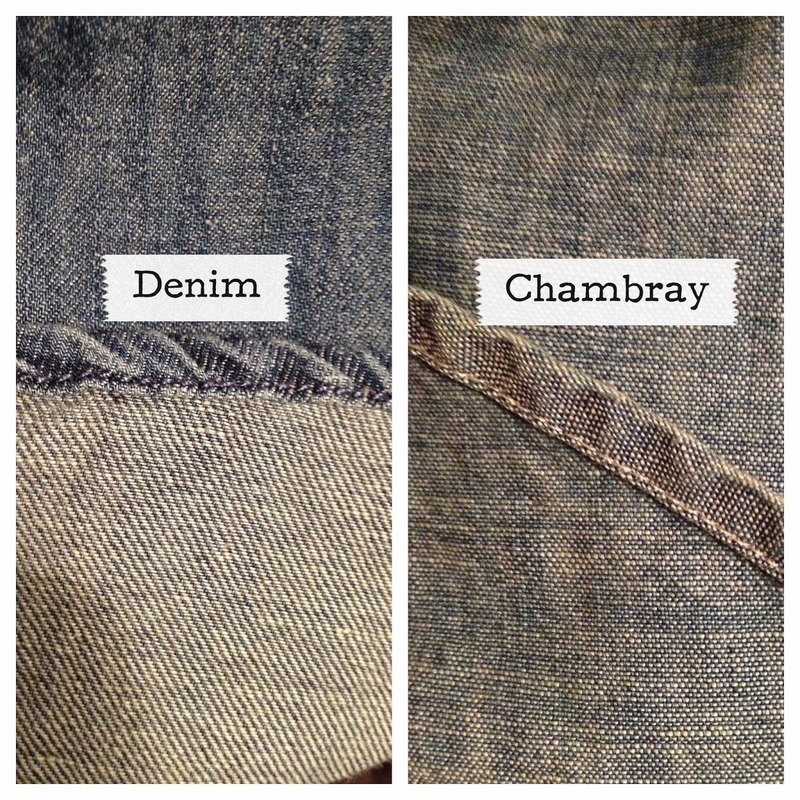 While chambray (below) and denim (above) are often confused for one another, they’re not the same fabric. A chambray is a plain weave fabric woven with a colored yarn in the warp and a white yarn in the weft. Like chambray, denim is made with a colored yarn in the warp and white in the weft, but is woven in a twill construction. The chambray’s warp and weft threads will alternate one over the other, while denim’s warp thread will go over two threads in the weft before going under one. Typically, you will notice a lighter twill style to the underside of a denim fabric, whereas the underside of chambray will appear much more similar to its face side. In shirt form, chambray usually tends to be lighter in weight than denim, though, not always. Chambray does tend to come in higher thread counts and is more easily “dressed up” than most denim shirting fabrics. While both have their roots in work wear, you’ll find many shirt makers who turn to chambray as a summer weight favorite. The chambray shirt is a staple that can effortlessly transition from season to season, making it one of the most versatile pieces you can have in your closet. Now that spring is finally on the horizon and you can shed your winter wares, mix this wardrobe essential with lighter layers, fun colors, bold prints, vintage inspiration, and even a little sparkle. With a fun, bright color and ladylike accessories, the chambray shirt is instantly a must-have for work and play. A no-frills denim shirt is a perfect match for a bold, colorful print, and even more so if you're mixing prints. 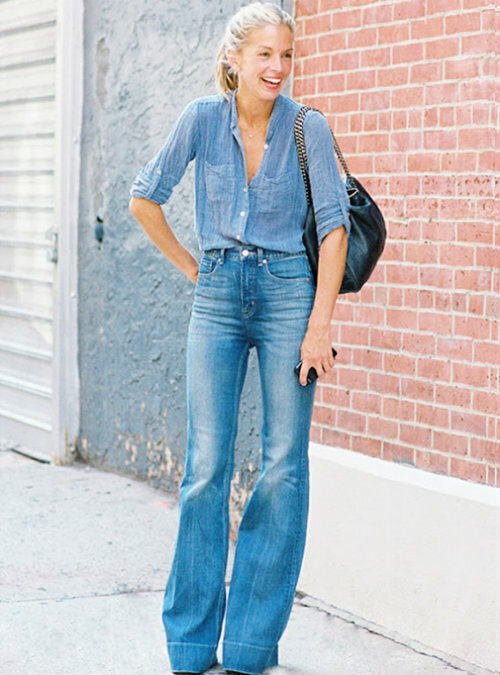 Tucked into a pair of wide-leg jeans, the chambray shirt takes on a '70s vibe that feels modern and fresh. Throwing on a blazer instantly adds polish to a casual all-denim look. A more feminine take on the Canadian tuxedo, this look is extremely customizable--wear with heels for a date, Converse for running errands, etc. Layered under a sweater, a chambray shirt adds warmth, not bulk, for cool spring mornings. Overalls made a major comeback and a chambray shirt goes surprisingly well with them. A more fitted silhouette, cuffed hem, and heels keep the look feminine instead of farm hand. A rugged denim shirt tied at the waist lends a casual feel to a ballerina-inspired tulle skirt and keeps the look from becoming too precious. 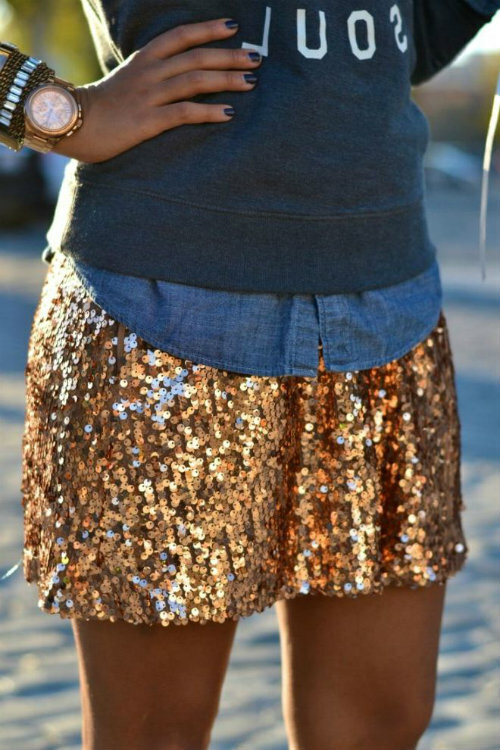 Just a hint of denim peeking out from under a sweater helps to tone down the glitziness of sequins. Paired with shorts, a floral print, and pastel shades of pink and peach, this looks screams springtime. 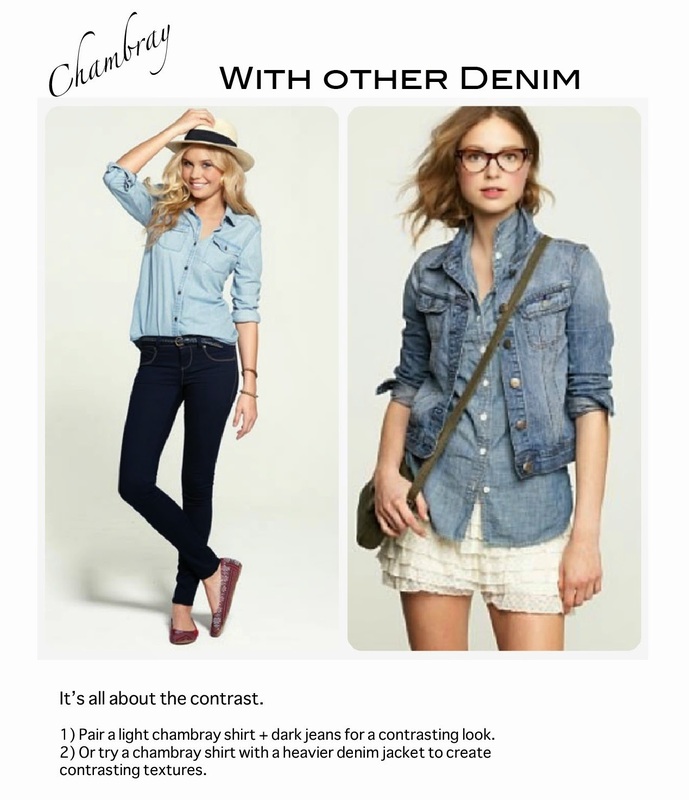 Since both, Denim and Chambray looks similar it does not mean you cannot wear them together. 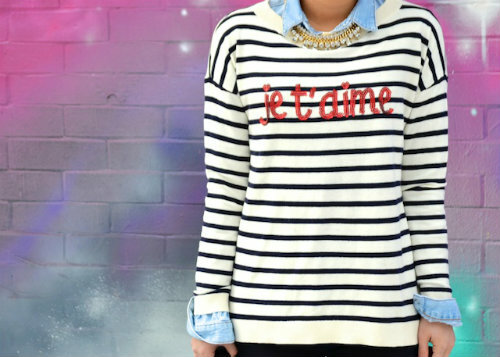 create a chic look using both of them in layers. Grab the look and do share it with us!